Scientific Name: Centaurea maculosa Lam. Note: Spotted knapweed is now properly known as Centaurea biebersteinii DC., though most of the literature and invasive species listings use C. maculosa Lam. Identification: Biennial or short-lived perennial with a stout taproot. Seedlings have pinnately to bipinnately dissected leaves, elliptic to oblanceolate, 4-8 inches in length. Plants have 1-20 slender, upright stems, 3-10 dm tall, most branching in the upper half. Flowering heads are solitary at the end of branches. Ray flowers are lavender to purple, rarely white or cream colored. Fruits are 1/8 inch in length with a tuft of persistent bristles at the tip. Nu merous Centaurea species introduced into the United States have become invasive, most notably, yellow st arthistle (C. solstitialis), diffuse knapweed (C. diffusa ), and Russian knapweed (C. repens L.). Spotted knapweed can be identified from other Centaurea species by the pronounced black tip on the bracts of the seed head. Current Distribution: USDA PLANTS Database lists C. maculosa in all states except for Texas, Oklahoma, Mississippi, Georgia, and Alaska. 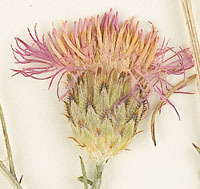 Site and Date of Introduction: Spotted knapweed's arrival in North America is estimated in the early 1890s. 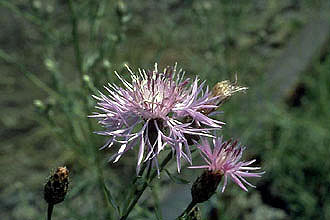 The earliest collection of spotted knapweed is from Victoria, British Columbia in 1893. Mode(s) of Introduction: Spotted knapweed most likely arrived as seeds mixed with a shipment of alfalfa seeds from Asia Minor. It was probably also carried in soil used as ballast on ships. Reason(s) Why it has Become Established: Spotted knapweed has long flowering period (June through October) and produces seed throughout that period. A single plant can produce over 1,000 seeds. The seeds are wind dispersed, but may also be dispersed by animals and birds and through the feces of birds and small rodents who may eat them . The seeds can remain viable in the soil for over 5 years and they can germinate in the spring through early fall in a wide range of soil depths, soil moisture contents and temperatures. The plants have few predators and are unpalatable to grazing animals. It can also produce a toxin called cnicin in its foliage and roots which retards the growth of surrounding plants, allowing it to spread more rapidly and form monocultures. Ecological Role: Rapidly colonizes disturbed areas. Retards the growth of surrounding plants due to the production of toxic cnicin in its foliage and roots. Root system does not anchor soil well leading to elevated erosion levels at highly infested sites. Because of its high competitive ability, spotted knapweed can dominate an area, leading to a reduction of species diversity. Benefit(s): Spotted knapweed has not been reported to provide benefits to the communities it invades. It has not been shown to provide a major supply of food to native animals or birds and it cannot be eaten by range animals. Threat(s): Biodiversity is threatened by the continued spread of spotted knapweed due to its ability to rapidly colonize disturbed areas, out compete most native species, and form large monocultures. Control Level Diagnosis: Highest priority. It already has such an extensive range across the United States and Canada that prevention of its spread into new regions is crucial. Mechanical Control: For small infestations of spotted knapweed, hand-pulling or mowing may help, especially early in the flowering season, although this will have to be repeated over several years to ensure success. Hot prescribed burns may reduce populations of knapweed by 5-90%, but burn intensity must be monitored, as low intensity burns may make the situation worse. Biological Control: Numerous organisms have been introduced to control knapweed. The moth, Metznera paucipunctella, introduced from Europe lays eggs in the flower heads and the larvae feed on the flowering parts. In some cases, the introduction of the knapweed gall fly, Urophora affins and U. quadrifasciata from Eurasia has resulted in a 95% reduction in seed production. The cochylid moth larvae, Agapeta zoegana, and the beetle, Sphenoptera jugosslavica , both feed on the roots of spotted knapweed. Success of these biological controls rely heavily on a number of factors, including the number released, frequency of release, genetic diversity of the released population, adaptability to site features, and habitat type. Picloram (Tordon) at 1-2 pints (0.25-0.5 pounds) per acre during rosette stage in the fall or bud to bloom stage in the spring. Do not use picloram near water or ground water sources. *All control methods need years of monitoring as knapweed seeds can lay dormant in the soil for over 5 years. Clark, S. E., R. G. Van Driesche, N. Sturdevant, J. Elkinton and J. P. Buonaccorsi. 2001. Effects of site characteristics and release history on establishment of Agapeta zoegana (Lepidoptera: Cochylidae) and Cyphocleonus achates (Coleoptera: Curculionidae), root-feeding herbivores of spotted knapweed, Centaurea maculosa . Biological Control. 22: 122-130. Mauer, T., M. J. Russo, and M. Evans. Element Stewardship Abstract for Centaurea maculosa Spotted Knapweed. The Nature Conservency. Image of herbarium specimen courtesy of The New York Botanical Garden.